Click here and see why you should! guided tour of the Bormio slopes with Alfredo or Michele FREE! Valtellina and biking, the perfect match! 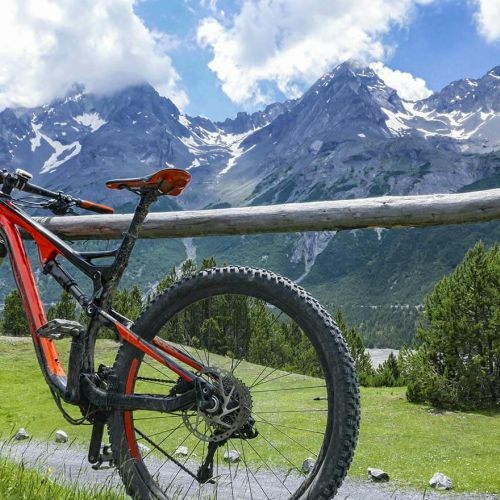 Plan your biking holiday and stay at a bike hotel in Bormio! Valtellina is a true paradise for bicycle and outdoor sports lovers. As hairpin turns and views are virtually countless, you can plan your excursions at your leisure - the only limit will be how fit and skilled you are. Valtellina's typical food and wines to add taste to your experience. Check out this page to find our best options according to period. Road or mountain bike, experience the emotions in the Alta Valtellina! Some of the highlights of Italian cycling are bound to these mountains and passes, like when Coppi rode over the Stelvio, and Pantani overcame the Mortirolo. Cycle on dirt tracks, but also ride through woodland and along lake shores -possibilities are further enhanced. Yet, it is advisable you are aware how trained you are, and choose a suitable route. A bike park all to yourself! Try out exciting Bike Park Mottolino, situated in Livigno, roughly a half-an-hour drive from here. It is a freeriding wonderland, with 13 adrenaline-filled paths, classified by 3 grades of difficulty. Winter cycling? Nothing can get you off your bike if you love it! Have you ever tested fat wheels? Fat bikes are enjoying steadily increasing popularity, as they make it possible to ride on the snow, combining the thrill of winter with cycling - an experience to be enjoyed at its full! This policy involves only the website of www.alpigolf.it and not other websites the user may consult by clicking on links. The policy is also based on Recommendation n. 2/2001 implemented on May 17th 2001 by European authorities for the protection of personal data, reunited in the Group instituted by art. 29 of Directive n. 95/46/EC, for the purpose of identifying a series of minimum requirements for the online collection of personal data and, in particular, the methods, time frames and nature of information the owners of the treatment must provide users who connect to websites, regardless of the purposes of the connection, as well as on further updates following the implementation of the GDPR and the delegation decree connected to the GDPR. The personal data indicated in this page are treated by ALPI E GOLF di CANTONI MICHELE , for the purpose of performing its activities. The juridical foundations for treatment on the website are consent, execution of a contract and pursuit of a legal obligation. The optional, explicit and voluntary sending of messages to the contact address of ALPI E GOLF di CANTONI MICHELE , as well as the compilation and forwarding of modules on the website www.alpigolf.it, involve the acquisition of the sender’s contact data, necessary for sending a response, and of all the personal data included in these communications. Specific information notes will be published on the website www.alpigolf.it for the supply of certain services. The optional, explicit and voluntary sending of data inserted in the data collection modules (forms), or in e-mails to the electronic mail addresses supplied on this website entails the acquisition of the sender’s address, necessary to respond to requests, as well as of eventual further personal data contained in the messages sent. We specify that personal and/or corporate data inserted in the forms on the website www.alpigolf.it is protected by ALPI E GOLF di CANTONI MICHELE and used only to answer user queries and to provide requested information and services. With the exception of the information listed above concerning data treatment, the user is free to provide ALPI E GOLF di CANTONI MICHELE with personal data via the info request modules. In any case, whenever such data is requested, a specific disclosure note will be supplied and, if necessary, the user’s consent will asked to indicate his/her consent. The recipients of the data collected due to consultation of the site listed above are subjects designated by ALPI E GOLF di CANTONI MICHELE as subjects responsible for the treatment, pursuant to article 28 of the Regulation. The personal data collected is furthermore treated by staff of ALPI E GOLF di CANTONI MICHELE on the basis of specific instructions related to purposes and methods of the treatment in question. ALPI E GOLF di CANTONI MICHELE, with legal and operational headquarters in Via Milano, 78 - 23032 Bormio SO, VAT code: 00977490143 in its quality of Owner of the treatment of your personal data, pursuant to EU Reg. 2016/679 - hereunder indicated as the 'GDPR' - intends to inform you with this note that the aforementioned legislation regulates the protection of subjects whose personal data is processed and that this treatment will be based on principles of correctness, lawfulness, transparency and protection of your privacy and rights. Owner of the Treatment: the Owner of the data treatment, pursuant to legislation, is ALPI E GOLF di CANTONI MICHELE, with legal and operational headquarters in Via Milano, 78 - 23032 Bormio SO, VAT code: 00977490143 in the person of its pro tempore legal representative. Your cycling holidays in a Bike Hotel, laundry and breakfast.
" Were do i begin. This is such a hidden gem in the mountains. My family and I have stayed here now six times. We have just booked again for Christmas. Michele and his wonderful family welcomed us into their hotel. They are friendly, laid back and always so very helpful. The accommodation is very comfortable and very clean. The food is excellent. All the staff work so very hard to make your stay as enjoyable as possible. Nothing is to much trouble at this idyllic hotel. ""